You wanna know something that makes you feel your age? When you are hosting your Life Group and mention the year you graduated from college, and your friend says that's the year he was born. Then, you see him holding his newborn and it dawns on you. I could not only be his mother, I could be a grandmother. On Sunday nights, we have a fun and chaotic houseful of toddlers and babies and it is the most awesome thing ever. It makes me all nostalgic for the days when my son was playing with toy cars instead of driving a real one. Since I've been going all MeMaw with our Life Group and actually starting sentences with the phrase "Well, back in my day when mine were babies," I thought I'd try to sum up the thoughts and all the feelings for you darling young moms who are taking your first stab at this mothering thing. Word of caution--I do not have this thing figured out and I never will. Oh wait--maybe that's the first thing I want to tell you. 1. 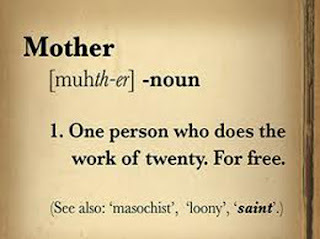 There is no one way to mother. No matter how certain and sure some other mom seems when they get all up in your business to give you unsolicited advice, the truth is that mothering is trial and error. Even if you were to gather the wisest of all moms with their amazing, wonderful and perfect children to ask for a step-by-step recipe, there's a big old problem with that. Psalms 139 tells us that we were each wonderfully and fearfully made and that we were, every one of us, knit in our mother's womb. Which means that everyone of us has unique bents and personality and strengths and weaknesses and developmental timing. There is no "one size fits all" advice for mothering. So, yes, by all means, ask for the wisdom of older moms and surround yourself with supportive mentors. Pick their brains all the live long day. And know that when you go to put their advice into practice, it's best done by prayerfully asking the God who made your child to direct you on how to apply such wisdom. P.S. Your child's unique life story is being written day by day. God is the author. He is the Owner's manual. I have never once gone to him in prayer about how to mother my kids when he gave bad advice. 2. Try to not worry so much. One of my biggest regrets about my first five years of mothering is how much joy I gave away because I was so frequently giving in to worry. Oh, yes, I'm still struggling with that, but I really see it when I look back on those first five years, before our bonus baby hit the scene and it was the ultimate "JUST GO WITH IT" moment because obviously, duh, God has his own plans. When my first baby was born, I had so overestimated my knowledge of babies because I had given advice to new adoptive parents for four years. What the heck was I thinking? I'm so sorry--every one of you precious adoptive parents that I had the nerve to act as if I had a clue. (Except for you, that adoptive mom who asked me if the rubbing alcohol swab went on the umbilical cord or the fresh circumcision. I owe you no apology. I was dead-on with my advice there). I was quickly humbled in the first week of parenting when I literally cried and fretted and lost hours of sleep over whether or not to give my baby a pacifier. When I fell into a horrid ugly cry with sincere despair because my baby was crying and what on earth is wrong? (Thank you, sis, for keeping a straight face when you told me that babies cry. That's what they do). And then, when I knew for certain that my baby was broken beyond repair and had some horrid disease and life would never be the same because he was projectile puking all over the house like some water sprinkler. News flash. Some babies have reflux. In my case, ALL my babies had reflux. Along with crying, puking. It's what my babies did. I fretted and worried and obsessed about every little thing. My husband truly is a saint to have stuck with me. And any friends that I still have from that era--you are a saint, too. The truth is, now when I look back, that I willingly gave away so much joy in the miracle of mothering those amazing bundles from heaven because I allowed my mind to get stuck in the quagmire of worry. I know that telling you not to worry is pretty useless. From one recovering worrier to perhaps another. But I can tell you this. When you are wound up and unraveling, stop and pray. Ask God to give you eyes to see the joy and the truth of the miracle that your child is. Stop and think about all the amazing milestones you've already successfully passed. Hold that little nugget on your chest and rock and sing to him or her and allow your mind to fast forward to the time when they will be too big for those things to happen. Savor the fresh smell after a bath. Wrap them up in a towel and take a moment to drink in that fragrance and commit it to memory. On your worst most stressful day, intentionally find a way to create a "happy" to hang onto as a foothold. 3. Enjoy it--it goes by so fast. I've already basically told you the ridiculous thing that I was told approximately 5,689 times a day. It was the statement that made me roll my eyes as a young mom. "Oh, enjoy it! It goes so fast!" Yep. One day when I got that line from a woman in Target, with my big pregnant self, my toddler son and my preschool son who were both acting like monkeys who had escaped the zoo, I was this close to handing them over to her and saying, "No, really. YOU enjoy it." I wish there was a better way to express this cliche. But I haven't come up with one yet. The truth is that the days of mothering are so very long and the years of mothering littles are so very short. I blinked and I've gone from agonizing over when to send my son to Mother's Day Out to going to the mail box to find stacks of college post cards from colleges all over the country. I used to obsess over my second baby who, for the love, would never sleep. Ever. Never. He hated to sleep. He fought it from the very first night home from the hospital. In fact, one of his first complete sentences to me was, "I no like sleep." Message received, little man. Do you see the dark circles under my eyes? Do you see my gray hairs? Now, that kid is taller than my husband and he lives for naps. He comes home from high school and naps as soon as possible. He even sleeps till lunch time on the weekends. When my husband asked if we should be worried about how much he sleeps, I said nope. He's got years of not sleeping from which to catch up. And I almost, just nearly, miss the middle-of-the-night visits to his room to try to console him back into sleep. 4. Keep margins. Always. Always. Always. Keep margins in your life. Don't think that an empty day on your calendar means you are available. We are all bombarded with opportunities to go and do and sign up for "Mommy and Me" this and that. Now, none of those activities are bad things. Really. There a jillion things with merit. But, your family time should be closely guarded. Fiercely guarded even. Your ability to lounge around on a Saturday or truly Sabbath on a Sunday or even sit around the dinner table together with your dear little munchkin in the high chair next to you-- guard those times with your very life. If your two-year-old is not yet signed up for select soccer, don't fret. Celebrate that actually! My sister and I made a pact when our kids were little that we would guard their childhoods. That we would be sure we didn't hyper parent, over schedule and burn ourselves out. And it's hard. It's counter cultural. It can make you feel like your kid has fallen so far behind that they won't catch up. Because their friends are all doing tons of activities and yours are not. When our kids were little, the rule was one kid, one activity at a time. The other kid's turn came next. Even with our good intentions, we had some busy weeks or some busy seasons. But we attempted to keep the idea in mind to let our kids have time to get bored or to build tents in the living room all day long or to go in the backyard and play. By themselves. For hours. Life is full of demands and tasks and schedules and opportunities to achieve and participate. And as your child grows, there will be busier seasons that are not as much within your control. But I'm telling you that I've never once, in 21 years of interviewing adoptive parents for home studies, had someone say that their biggest regret from childhood was that their parents just gave them too much time to make memories as a family. In fact, they tend to speak way more about the family trips, meals and traditions than they speak of the sports teams or school activities. Family time. It's the glue that holds you together. And someday, believe it or not, you will actually ask that child who never let you go to the bathroom by yourself if he will please just spend some time with you. 5. Guard your marriage. Yep. Guard your family time. Guard your marriage. Fight for your marriage. Invest in your marriage. Now, this is hard to do when the squeaky wheel gets the oil, and boy, do your littles know how to squeak. But, figure out ways to spend time as a couple and have an actual conversation. And when you start to feel disconnected with your spouse, do something about that. Babysit swap with a friend. Beg a grandparent. Or even put the baby down early and sit on the couch and listen to each other. Even if its only for ten minutes because you are both drifting off to sleep. Find a way to go away together, at least annually. For a night or two. Or send Junior to grandma for the weekend. But, remember that the center of your lives is Jesus. Then it's you and your spouse. Your marriage is central to your family. When you are marriage centered instead of "kid-centric," you are giving the biggest gift ever to your children. They need and want a mom who loves their dad and supports him. They need and want a dad who shows them what its like to lead a family and love a woman like Christ loves the church. So hold hands. Hug in front of them. And totally gross them out by kissing in front of them. They may protest loudly, but they secretly love knowing that their family is secure because mom and dad love each other and are completely committed to this family unit. 6. Everything you do matters. Every little act of service matters. Every little hug and cuddle and diaper change and bottle fed and sippy cup filled. Every time you pick up the toys for the millionth time. Every little cheerio and goldfish you pick up from the mini-van. Every time you pack that dang diaper bag AGAIN and every late night session with a crying baby. Never buy the lie that it's mundane and worthless and insignificant. Every little way that you serve your family is seen by the Father who notes exactly what you are doing. So preach that to yourself on your harried days. Tell yourself when you are worn out that God sees every little thing and he loves how you love and serve the ones he's given you. Remind yourself that you are doing Kingdom work by investing in the next generation, with even the littlest and hardest things you do. It ALL matters. And you are amazing, by the way! I could go on for days with all the things I want to tell you. I'm in this place of watching the sand fall faster in the hour glass and realizing that my season of launching my kids out on their own is flying at me. And it makes me want to choose the chaos, be the host, drive the car pool, choose the joy, make the memory. It makes me pray harder for God's guidance and protection as my kids make their own ways. It makes me want to gather you all up, every last one of you parentals, and sit you down and applaud you endlessly. I've gone from 24 hour care giving to intense discipline training to preschool teaching to elementary school guiding to this season of becoming a consultant and a coach. I'm moving to the sidelines to cheer my kids on, because its time I'm not standing in the middle of their game. It's time I trust that I've tried to seek the Lord and mother well and it's time to loosen the reigns a little bit. Don't get me wrong. I'm still the parent. And I am still the boss of them. I will endlessly stalk and hound them, but I am also learning to listen more and ask more questions and entrust some things to them. If I want my kids to soar on their own in the very near future, then I need to give them this practice field under my watchful eye. I can't be the referee throwing penalty flags every two seconds. Here's the bottom line, Rookie Moms. You've got what it takes. The One who made those little ones entrusted them to YOU. He picked YOU for the job. Because he believes you can do it, with his strength, power and guidance. And he will happily direct you every second of every day. He meant for you to know that he loves you and he chose you for the precious job of mothering that child placed in your care. He is cheering you on! And so are the Veteran moms in your life. We are all misty eyed and crazy over here with our own nostalgia, and it makes us want to say, "GO GO GO, Little mama!" We will also say things that sound stupid like, "It goes so quickly! Enjoy it!" But we might have learned some things from our own mistakes along the way and we will be happy to share.